WITHAGRIN is based on the Tahoe 19 design by Ken Hankinson. Per the clients specification, the deck layout was reconfigured as a walk-though utility to provide greater usability. WITHAGRIN was exhibited at the Wooden Boat Show in Mystic, Connecticut in June 2014 where it received Best Professional New Build and will exhibited by its owners at various shows near Pittsburgh. 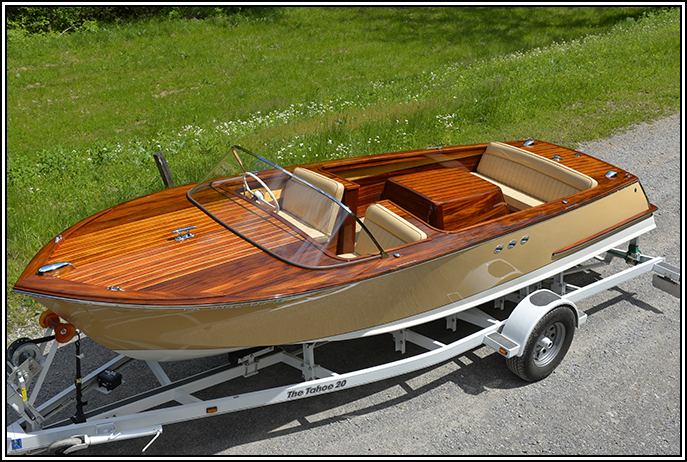 The framework is constructed of African mahogany; the 5/8" bottom and 1/2" hull sides are comprised of multiple layers of Okoume BS1088 Marine Plywood set with epoxy and fastened with composite staples. The 1/2" decks are comprised of Okoume BS1088 Marine Plywood and African mahogany with bass wood inlay. Hull and deck coatings are by AWLGRIP; AWLGRIP topsides and AWLSPAR Varnish. The bottom paint is Interlux VC Performance Epoxy.